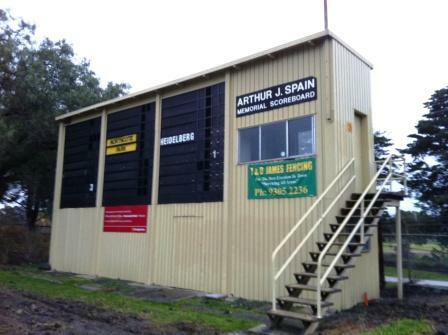 Photo by Jeff Lawton, who notes: “The scoreboard at Westgarth Street is the Arthur J Spain scoreboard, named after a former Northcote councillor and Northcote Cricket Club committee man. 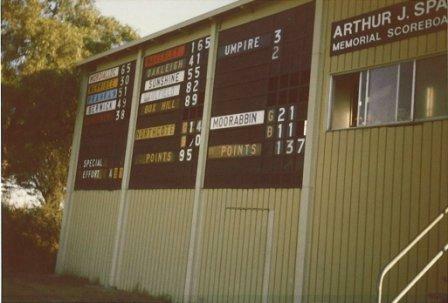 The fact that Northcote Cricket Club was a member of the Victorian Cricket Association meant that Northcote Football Club ended up with a much more elaborate scoreboard than other VFA clubs. The coloured club names were a nice touch. Northcote Football Club folded in 1987. Its past players include Fitzroy wingman (Sir) Douglas Nicholls, later Governor of Australia, and seconds player John Cain Jnr, later premier of Victoria. Several of the clubs in Jeff’s photo folded in the late 1980s and early 1990s as the VFA struggled to keep a foothold. The ground is now home to Northcote Park Football Club. The Cougars play in Melbourne’s Northern Football League. Further reading: Football Grounds of Melbourne by Santo Caruso, Marc Fiddian and Jim Main (Pennon Publishing 2002).